The Polyform Mooring Buoy come with 75" diameter, swivel and a solid short mooring rod in hot dipped galvanization. Polyform CCE/CCD series. Suitable for max mooring load of 58kg once full inflated including chain and shackles. 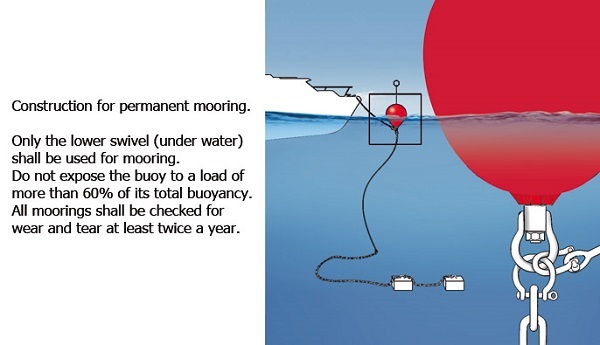 The Polyform inflatable mooring buoys are offered with either a short mooring rod (CCE-type mooring buoy) or a long mooring rod (CCD-type mooring buoy). The mooring buoys are fully assembled by the factory and only need correct inflation before use. The rods include a swivel at the lower end and all parts are hot dipped galvanized.